When it comes to cards for kids' birthdays I need to step outside my normal repertoire. Particularly when it's for one my daughter's friends. My little C is very determined and expects certain flair and look to the cards that she gives her friends (I wonder where she gets that from?). So, here is the result of something that we worked on for the weekend. I have a hard time when it comes to finding 'cuter' graphics to use, so when I found Lettering Delights I killed two birds with one stone. I found alternatives that the kids will be happy with and I save time by using cutting files that already exist. Even though I love coming up with new designs, the truth is that sometimes it's really nice not have to start from scratch. Having said that, I rarely use the very few Cricut cartridges I have. 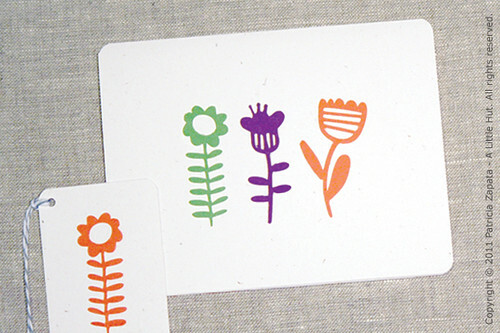 The flowers are from the Quirky Flowers set and the leaves below are from the Quirky Trees set. 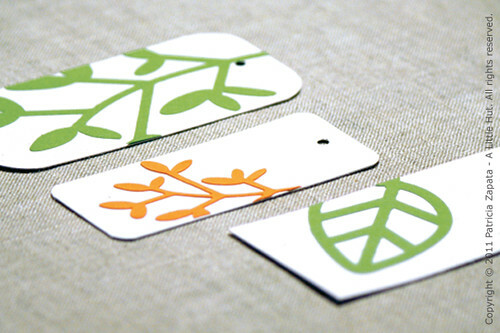 Yes, more gift tags. I can never have too many! I don't usually post over the weekend, but I thought this would be worth it for those of you that work with digital cutting files. Lettering Delights is offering a $49 bundle of 50 sets with at least 15 single layer images each. Can you imagine all those files? The entire bundle is regularly $150 and will be on sale for the next 2 weeks only. Another newsworthy item is that all Lettering Delights images are now available in AI, DXF, EPS, GSD, JPG, PDF and SVG formats. If you're interested in this bundle you can find it here. Full disclosure: I want to let you know that I am now a Lettering Delights affiliate. It's a small way in which I can continue to maintain my blog ad free. Making a blog sustainable could be a post all of it's own, right?